Contemplating ships in the harbor on a foggy morning. 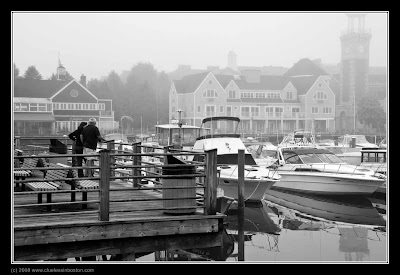 When I went to the Maine Photographic Workshops ages ago, one of my favorite things to do was to go to the harbor in the morning when it was foggy. It was always so peaceful. Re: Blueberry pies. . . . Unfortunately, I didn't have any as I don't eat stuff made with white sugar. They must have been pretty good, though, as they were selling the pies for around $14/pie, and people were buying them. Very nice gradient in B&W. Fog is a good friend ! That's lovely - and i think the B&W has made it an even better picture, it really adds to the atmosphere. This is a very New England-y looking photo. I always enjoy seeing your B&W photos, but this one is particularly nice because I think it is difficult to capture fog. I like your post. The photograph is great! Good morning! For some reason it makes me think of Main instead of Boston. Why is that? Lovely capture. Some people are a little afarid of using fog and mist, but this a perfect example of these elements put to good use. B&w the perfect medium. LOVE IT- beautiful and as always, B&W is a fav medium of mine, so I think it makes this look all the more appealing.